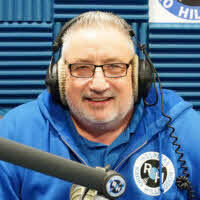 I have been volunteering in Hospital Radio since 2012, started at Harefield Radio then joined Radio Hillingdon, I started on the request show Thursday nights, with quite a few presenters over the years. Shortly after I that I added 2 till 4 with Colin Moore, on Saturday afternoons, a mixture of relaxing music and the odd brain teaser, and my 3 at 3 feature. 3 pieces of music with a connection. I joined the committee to help with the running of the station, and was soon elected a Station Director. A very rewarding position especially working with the other members and our Engineering Team in totally refurbishing the studio complex. In 2015 Mark Grantham joined the station and was linked up with me on the request show, it was a marriage made in heaven. ( so Mark says) We hit it off straight away and formed a repartee, unfortunately we no longer present on a Thursday night, but do a show Monday to Friday 10 am and 1 pm. facebook.com/markandmooreinthemorning.